Home » celebration , comedy , education , humor , muppets , sesame street » Happy 40th birthday SESAME STREET! "You've never seen a street like Sesame Street. Everything happens here. You're gonna love it." Forty years ago today a new kind of television burst onto the scene. It was an educational program, but one that eschewed dour and boring lessons. Instead, fast-paced skits and high-brow humor were to be the norm. And the cast of characters of this new show? 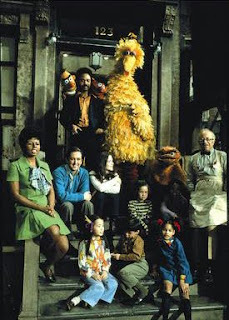 An eclectic mix of adults, children, puppets, monsters, grouches... and one very big bird. Forty years later and Sesame Street is still going strong! And after all this time Gordon is still right: we've never seen a street anything like Sesame Street. Everything does and has happened there. And we're still loving it. So you know, what better time than this to put up another classic Sesame Street video? Except I've posted so many of them already! Which one should I use? I know: how about this classic sketch featuring Grover and Fat Blue, in which Grover recommends the "little" hamburger!